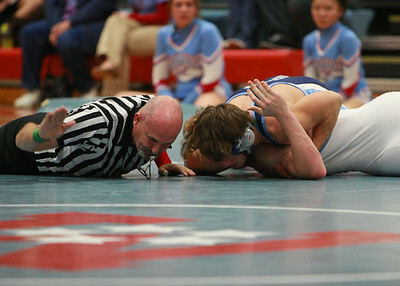 These are some of the best photos I shot while watching six years of high school wrestling. Although I never wrestled, I learned a deep appreciation of the challenges of skill, experience, and strength required to excel at this sport. It is also one of the best sports for a photographer. When I bought my first high quality digital camera, the professional photographer who sold it to me showed me his portfolio that included photography of the Olympics. He told me that wrestling was his favorite sport to photograph due to the fascinating moves and the inherent drama of the sport. Circling. One of my best action photos of wrestling I have ever shot with a balance of motion and leverage. This is Jimmy Bittner versus Thomas Jefferson High School. The AA and A State Championship tournament held at the Salem Civic Center in Salem, Virginia. In the early rounds, there are eight mats with simultaneous wrestling, four on the left for the Single-A Division, and four on the right for AA. The Merkle. Matt Schwee versus Warren County High School in 2005. The Mills. 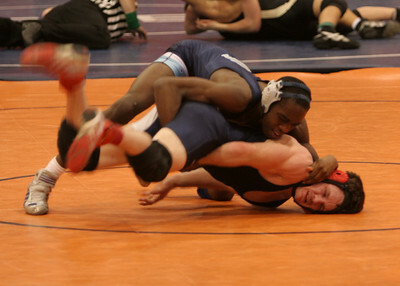 Joe Mayes pushes his opponent over for a quick pin. Throw and head lock. Bryan Morrison throws Marshall over and puts the head lock on. Balance. 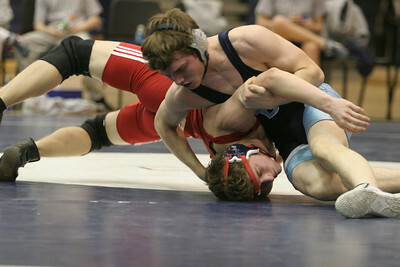 Sam Kopciak rolling an opponent. The Look. Ryan Robles pins Loudoun County. Defending a shot. 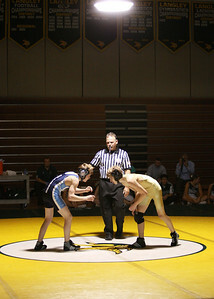 Daniel Casola versus Woodson at the 2007 Liberty District Championship. Joseph Casola drops a wrestler for a pin. David Helmer of Langley High School faces off with South County at the 2009 Northern Region Championship. David Helmer of Langley High School takes a shot at the finals of the 2009 Northern Region Championship. Kyle Jones wins a match with a pin at the 2004 state championship. Kyle would eventually place fourth in the state. Kevin Eberling punishes another wrestler with the scissors. Ruffin looks for a turn at the 2004 Regional Championship at Orange High School. Wrestling at the main event under the spotlight at Langley High School. The Pin. Joe Mayes versus Marshall High School. Stack pin. Kyle Jones versus Loudoun Valley High School. Wave. Eric Vogel looks for an elusive cradle against Grundy High School, a perennially excellent wrestling school. Both looking for an opening, rolling through a hold. This is Kyle Jones versus Colonial Forge at the quarterfinals of the 2005 Virginia State Championship.